These Thanksgiving Crostini take all the favorite flavors of Thanksgiving and wrap them into one awesome appetizer! They are made with Philadelphia Cream Cheese and are sure to impress! Welcome to another Man Monday, my friends! So, if you guys haven’t figured it out by now, I love taking normal, everyday recipes and transforming them into something else, while still maintaining the integrity and deliciousness of the original idea. Need proof? Check out these recipes: Philly Cheesesteak Cups, Chicken Cordon Bleu Cups, and Peanut Butter and Jelly Cupcakes. Well, I’m at it again this week, except this time I’ve added another mantra to the mix that I often preach: reusing leftovers (see: Steak Crostini with Blue Cheese Sauce)! I used to hate Thanksgiving. You know why? To me it was just another excuse for people to glut themselves in disgusting ways in the name of celebration. It probably doesn’t help that my dad made turkey dinners at least twice a month my entire childhood. Love you, Dad! 😉 So when Thanksgiving dinner finally came around, there wasn’t much that was special about it. I mean, if you have a turkey dinner half as often as you fill up your car, it gets old! Friends, I’m here to tell you: I’ve seen the light. Thanksgiving dinner is incredible! How did I come to this realization? Step one: Stop eating turkey dinner 25 times a year; limit it to once or twice, tops, thus increasing your overall appreciation for the occasion. Step two: Make stuff you can be proud of! Employing these two very basic steps improved Thanksgiving and elevated it to a day to actually be thankful for. Today’s recipe is all about making food you can be proud of. So what’s the key to making this an appetizer you can be proud to serve? It’s all in the cream-cheese spread! There is something magical in the cream cheese, dill, and cranberry combination…al;kdflsjljimcn555… Oops! I just drooled all over my keyboard and had to clean it up. Sorry about that. Now, around here, we hands down, every time buy Philadelphia Cream Cheese—there is no substitute, honestly. Anything else just tastes…different. You know, like when your grandma changes the recipe to her famous pecan pie ever so slightly—it’s just not the same, Grandma! Change it back or I’ll never come over again! *ahem* Uh, anyway, back to the post. These Thanksgiving Crostini take all the favorite flavors of Thanksgiving and wrap them into one awesome appetizer! 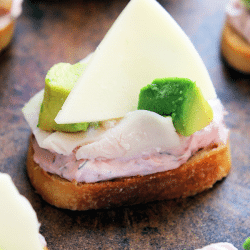 Made with Philadelphia Cream Cheese, they are sure to impress! Preheat oven to 350ºF. Slice your baguettes into ½-inch slices and rub vegetable oil on both sides of the slice with a pastry brush. Bake for 12 to 14 minutes, until lightly golden. In a medium bowl, whip the Philadelphia Cream Cheese until fluffy and smooth. Add the cranberry sauce and dill, and mix well. 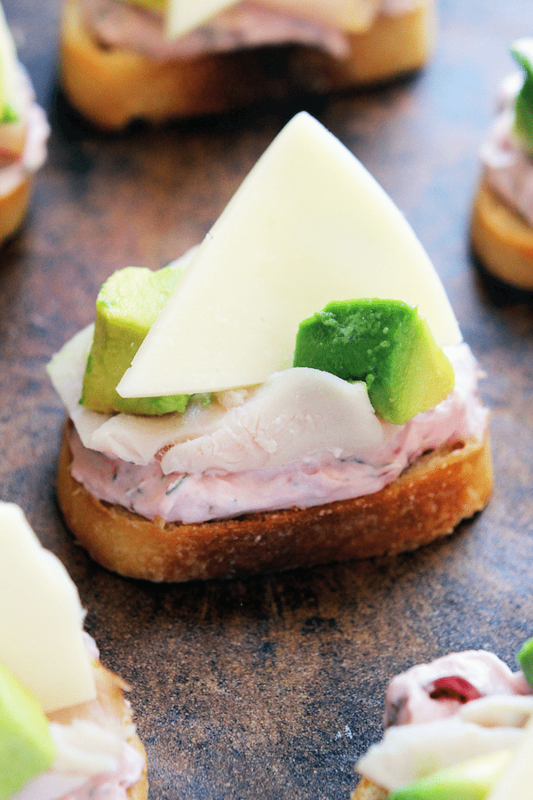 Spread a tablespoon of cream-cheese mixture evenly atop the crostini. 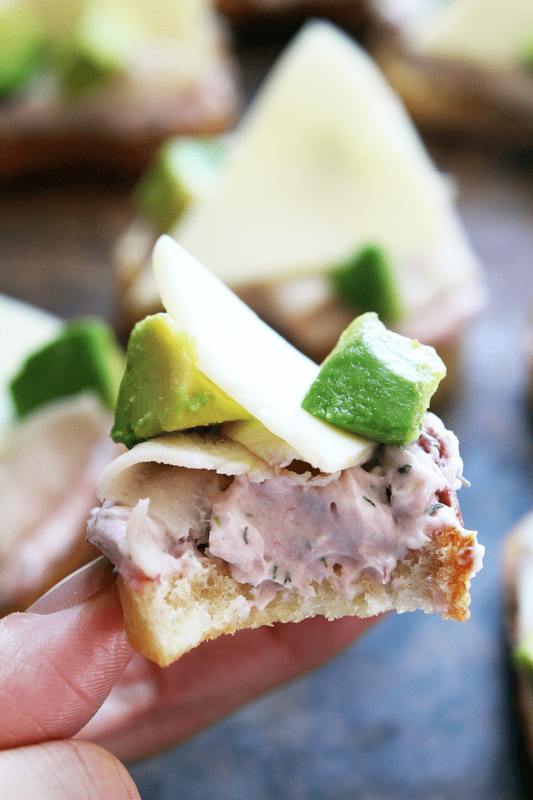 Top with a turkey slice, avocado, and a provolone slice. Enjoy! One serving is 4 crostini. Use these little puppies to start off your Thanksgiving meal. Get the crowd all swoony over your food before they even start the big stuff! It will work. Promise. On top of that, you can eat it for weeks after Thanksgiving by using all that leftover turkey. Waste not, want not. Or, waste not so the Ghost of Turkey Day Past doesn’t haunt your gluttonous soul and drag you down to room 116 of hell. (That’s the room wasters go to. Surprised you didn’t know that.) Thanks to Philadelphia Cream Cheese for allowing me to partner with them to come up with some fun and delicious recipes! I had a blast. 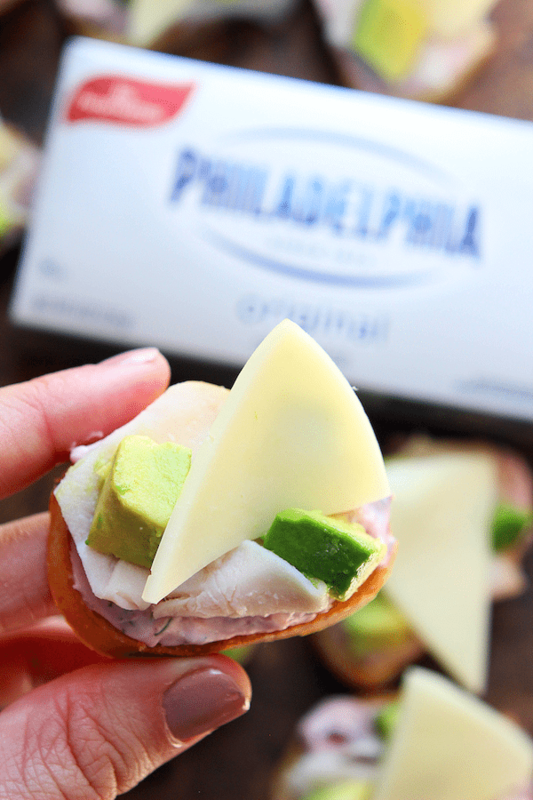 Do you have any favorite holiday recipes using Philadelphia Cream Cheese? I’d love to hear your favorites in the comments below. For some additional inspiration, click here. -Zach Facebook | Pinterest | Twitter | Instagram | Contact Be sure to pin this for later!